By the time my high school pal Danny Hoekstra loaned me Saxon’s “The Eagle Has Landed,” I was already a fan of the British band’s music thanks to legendary San Antonio deejay, Joe “The Godfather” Anthony (look him up). As much as I loved Saxon’s heavy brand of motorcycle metal, it was the sleeve of “The Eagle Has Landed” that added the TKO. There on the back cover was an indelible photo of singer Biff Byford caught on stage in all his explosive, hair-flailing glory. Sporting skintight white/silver pants, a leather biker jacket and raising a defiant upper-cut fist, Biff — in that one single photo — perfectly embodied all things heavy metal. Hell, just looking at that photo still makes my ears ring! 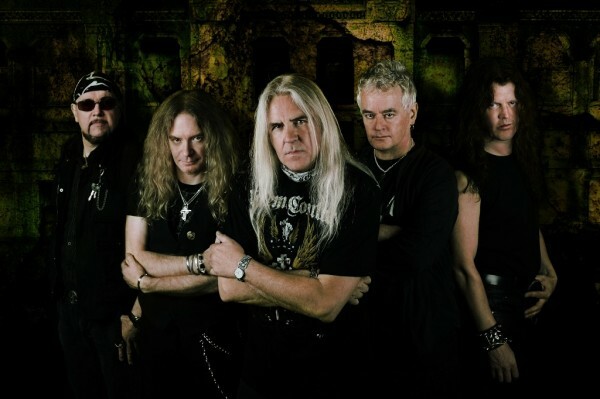 With the recent release of Saxon’s well-worth-owning umpteenth album, “Call to Arms,” I had the opportunity to interview Biff and also see the band live again during a recent return to San Antonio. As always, Saxon delivered the kind of high-energy performance that should be impossible for a group whose diehard frontman is now 60 years old. 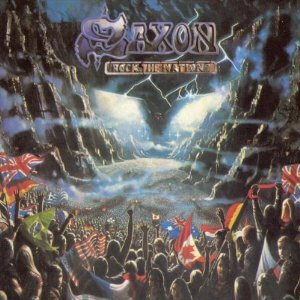 Judas Priest may get all the acclaim for being Defenders of the Faith, but Saxon has been in the game nearly as long and has been equally unwavering in flying the flag of metal. That said, I give you a typically awesome interview with one of metal’s most enduring crusaders, the great Peter “Biff” Byford. We wanted a change on this album, a slight shift with the production techniques. We went back to the zone of the ’80s a little bit with some of the lyrics on songs like “Ballad of the Working Man” or “Surviving Against the Odds” or “Back in ’79,” so we did go back to that sort of era to get the working class lyrics in there. It’s a bit back to our roots. I think you’re right. It’s still got the modern edge, but I think it’s also back to our roots. Don Airey of Ozzy and Rainbow fame plays keyboards on a couple tracks. How did that come about? 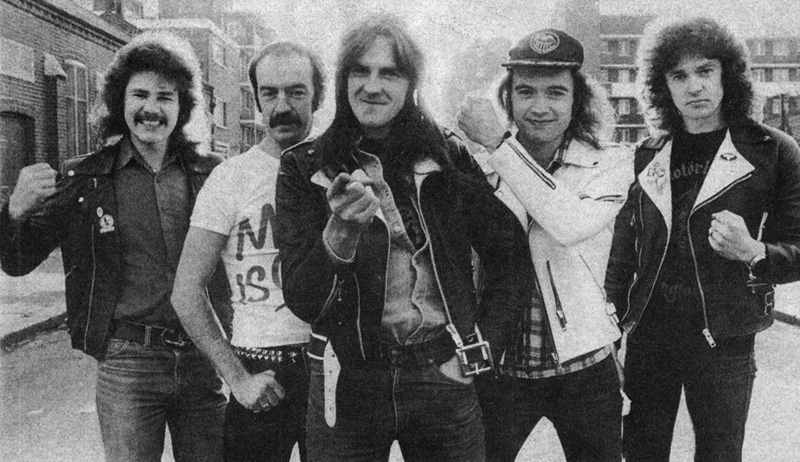 MOTORCYCLE MEN: Saxon circa 1980 was, left to right, guitarist Graham Oliver, bassist Steve Dawson, singer Biff Byford, guitarist Paul Quinn and drummer Pete Gill. Today, only Biff and Quinn remain. The Digipack version of “Call to Arms” contains a bonus disc of a live performance recorded in 1980 at Donington. Was that material recently rediscovered or have you been hanging on to it for 30 years? 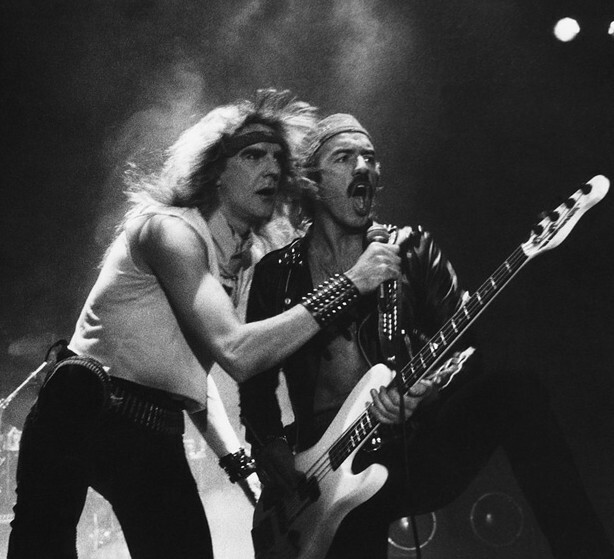 Why did Saxon have such a tough time breaking big in America while bands like Iron Maiden and Judas Priest were able to connect and find success? I don’t really know, actually. 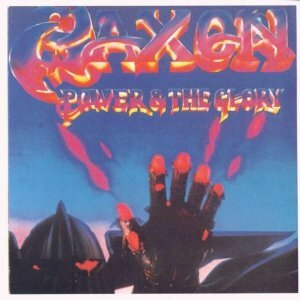 We were really close to breaking on “The Power & the Glory.” I think we did about half a million albums in America and it wouldn’t have been too hard to take that to platinum, but I just think the choices that management and the record company were making at that time were probably more geared toward Europe. I just think we weren’t here (in the U.S.) enough, really. It’s a bit said, really, ’cause we were this close to breaking and then we were sort of pulled off and sent back to Europe to do some more albums. I suppose greed had a lot to do with it (laughs). You know? That word that keeps cropping up in this business? Greedy record companies and greedy managers probably thought we were making money in Europe and probably losing it in America so … It’s sad, really, that people were near-sighted rather than looking at the full picture. Metallica drummer Lars Ulrich is a big Saxon fan and James Hetfield has even said Metallica’s second gig EVER was opening for Saxon. Was there ever any talk of you guys touring with them in America? That would’ve been huge exposure. What was your first impression of America when you landed here in 1979 or 1980? Yeah, a lot of people saw us for the first time on that tour. It was a great tour, but unfortunately we only did about four or five weeks of it. That was one of the first big mistakes. We should have done the whole tour. I think we could have broke big on that tour. Maiden broke big on that tour. I think we did half a million albums on that tour. It was a bad decision to be taken off that tour. A lot of people think we were kicked off that tour, but we weren’t. Not long afterward Saxon was headlining with Motley Crue as support. That seems like an odd pairing. What was it like for you? It was just 24-hour debauchery, really (laughing). It was fantastic to be on that tour from a sexual point of view, if you want to say. They were great to tour with, actually. They were touring the “Shout at the Devil” album and they were real big Saxon fans, especially Nikki Sixx. He was a bit like Lars (Ulrich), I suppose. He was into the New Wave of British Heavy Metal. I’ll always have fond memories of that tour (laughing). In fact, we wrote a song about it called “Rock-n-Roll Gypsies,” which is about the girls and the groupies and everything that carried on in them days. It was real good fun (laughs). How the hell did you manage to get Elton John to play on Saxon’s 1986 “Rock the Nations” album? We were in the studio at the same time and our producer knew him. We thought it would be cool if he would play on “Party ‘Til You Puke.,” ‘cause that’s not really his style of music (laughs). We thought it would be cool if he would play on something that wasn’t naturally his type of style. He was cool, actually. He came and played, and we were hanging out with his band, really. I think he was helicoptering in and out of the studio every couple of days on his way to royal weddings or whatever. We got to know the band more than him, really, but he was a nice enough guy, ya know? There’s two stories, really, running parallel. One is about the big power cut (outage) in New York when this plane was about to land and the runway lights went off. So the plane was diverted somewhere else to another airport in America. That’s the 747 side of the story. The chorus is about how nine months after the power cut the birth rate tripled (laughs). So I was just thinking about two people maybe meeting in the lift (elevator) or something, or in the dark, and becoming intimate. So, it’s two stories running together, really. It’s one of our signature tunes, I suppose. What do you do for fun when you’re not on stage? I spend time with my family, really. I have a second family now that’s quite young. I spend time with my boys, really. When I get back, they’ve got me building a skateboard half-pipe (laughs). That’ll keep me busy. 2Fast2Die would like to add: In 20 years of interviewing “rock stars,” Biff has always been consistently down to earth, humorously insightful and more than willing to discuss a number of topics that may or may not be related to promoting his new album. Always fun and very much appreciated. 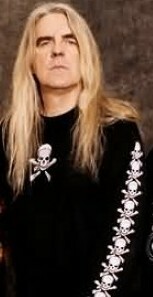 Biff, I salute you and thank you for giving 2Fast2Die an extensive and exclusive interview!! 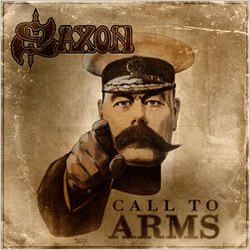 For more on Saxon, go here. another great interview, MDave. you know i’m no Saxon fan, but have nothing but respect for them and you. Awesomeness!! Can’t get enough of these Rokkas!! This is a brilliant interview with Biff and great insite into SAXON’s US career to date, loved the Motley Crue part!! As Biff say’s keep lfying the flag!!! PLAY IT LOUD!!! 1st memories of Saxon sitting on the side Kirby Jr High approx 81-82 listening to Denim and Leather with the only other two metal heads in the school. (Craig and Paul from my first band). When we first started jamming we learned Princess of the Night, Power and the Glory, Wheels of Steel and Crusader. To say they had an early influence on me is an understatement. REAL METAL WILL NEVER GET OLD AND DIE!